Tie ring featuring an edelweiss flower surrounded by a filigree design. Tie Ring with Edelweiss flower and filigree adornments. 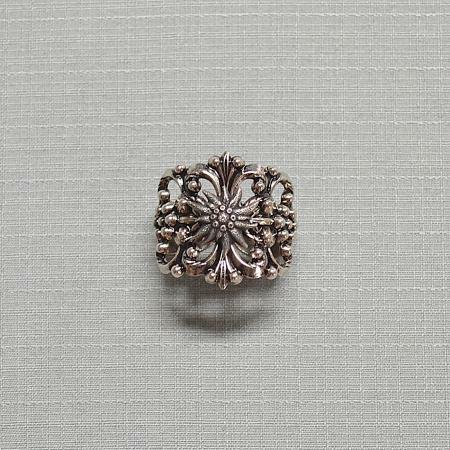 A tie ring featuring a beautiful white edelweiss flower surrounded by a filigree design. Men’s plaid shirt with cream, green, and brown colors. Features long sleeves, edelweiss adornment on front of shirt, and left side pocket. Also features metal buttons and green suede around buttons and pocket. Made of 100% cotton. Imported from Germany. Embroidered Oktoberfest with Beer Mug design. Embroidery by Ernst Licht. A tie ring featuring a dancing couple, surrounded by a wreath design. A gamsteeth replica tie ring design. A tie ring featuring a Auerhahn on the front of it, surrounded by a filigree design. Embroidered G’Suffa Man with beer and pretzel design. Embroidery by Ernst Licht.